Designed for the World's Best Gamers. The 9th Gen Intel® Core™ processor family, Intel's newest generation of processors. Game, Record and Stream without compromise. RTX Gaming Laptops - Available Now! NVIDIA® GeForce® RTX delivers the ultimate PC gaming experience. RTX graphics cards bring together real-time ray tracing, artificial intelligence, and programmable shading. Find our tailored specifications for your favourite games in our game based computers section. Ensure you keep your competitive edge whatever your budget. Ready to ship for next day delivery. Wide range of PCs & laptops available to cater for all budgets. Configured and assembled by our expert technicians. Incredibly powerful workstations, featuring multi-core performance and blistering speed. Essential for your professional studio. Based on the latest graphics and chipsets, custom build your gaming PC here! Why buy off-the-shelf? Custom build your ideal laptop here only pay for what you need! No matter what PC you're looking to buy - we've got the ideal custom built PC for you! Get Division 2 with select Samsung SSDs! From £1,180 inc VAT and delivery. From £1,730 inc VAT and delivery. From £1,980 inc VAT and delivery. From £2,200 inc VAT and delivery. From £1,350 inc VAT and delivery. From £1,360 inc VAT and delivery. From £1,580 inc VAT and delivery. From £1,780 inc VAT and delivery. From £2,360 inc VAT and delivery. UK Mainland Next Day Delivery! Not sure what PC you need? Not sure what you need? 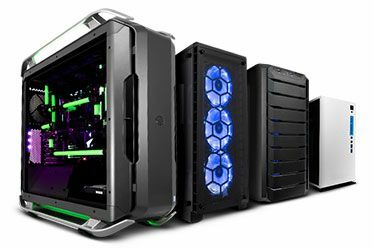 Try our jargon free configurator or choose a system based around your favourite game!